Israelis have benefited from the universal health coverage enacted in 1995 following the National Health Insurance Law (NHIL), and they are in comparatively good health: for example, Israel has a relatively high life expectancy at birth (82.5 years) – among the highest in the world – and low infant mortality (3.1 per thousand births) – among the lowest in the world. However, the current health indicators reflect past investments in the healthcare system. There are signs today that the relative health status of Israel’s population may deteriorate in the future, as a result of rising tension between medical needs and resources that stems from state policy or, rather, a lack thereof. The medical needs of the population are rising. Israel has a young but rapidly aging population. Simultaneously, Israel has rising fertility rates – already the highest among the developed nations – requiring a growing investment in pregnant women and infants. Additionally, the country faces growing risks of modern diseases that have an impact on the entire population, such as obesity, which can be linked, in part, to increasing income disparities and rising food prices. The challenges the system faces in response to these rising needs is reflected in its lagging funding. Worse, changes in the composition of this funding aggravates the situation. In 2017, the share of healthcare spending in Israel stood at 7.4% of GDP (compared to 6.9% of GDP two decades prior). This figure is lower than both the OECD average of 8.9% and the 11.0% average among countries whose healthcare systems are based on sickness funds (HMO-type organizations) like in Israel. The gap between Israel and these other countries has been increasing over time, though they do not face an increase in medical needs similar to Israel’s. As for the composition of spending, the share of public spending out of total healthcare spending has been falling, and is relatively low compared to other developed nations with universal coverage. 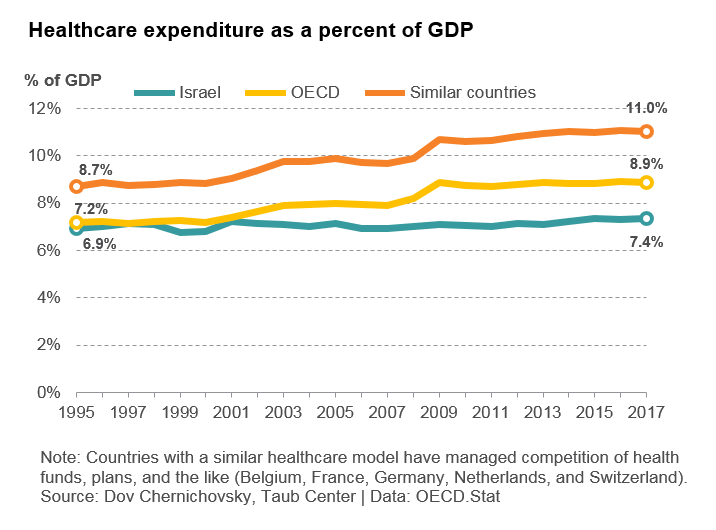 Public spending out of total health spending stands at about 63% in Israel, compared to 73.5% in the OECD, and 78% in countries with similar healthcare systems. Consequently, households are spending more and more out of pocket for their medical needs: healthcare spending out of household disposable income nearly doubled between 1997 and 2016. These developments mean that access to care in Israel, manifested, among other things, in prolonged waiting lines, has become increasingly dependent on residents’ ability to pay – contrary to the fundamental philosophy of the National Health Insurance Law. Worse, regulations of private and supplemental insurance (which is quasi-public) mean that physicians are currently allowed to simultaneously be employed in both the public and private spheres. This results in the widespread practice of doctors referring patients from the public system to their own services in the private system, where they can charge higher prices for treatments that could largely be administered through the public system as well. This results in ethical issues, supplier induced demand for private services (including potentially unnecessary procedures), inequalities in access to care, and inefficiencies in the system. At the same time, health care prices have increased, mainly due to rising physicians’ wages and fees. 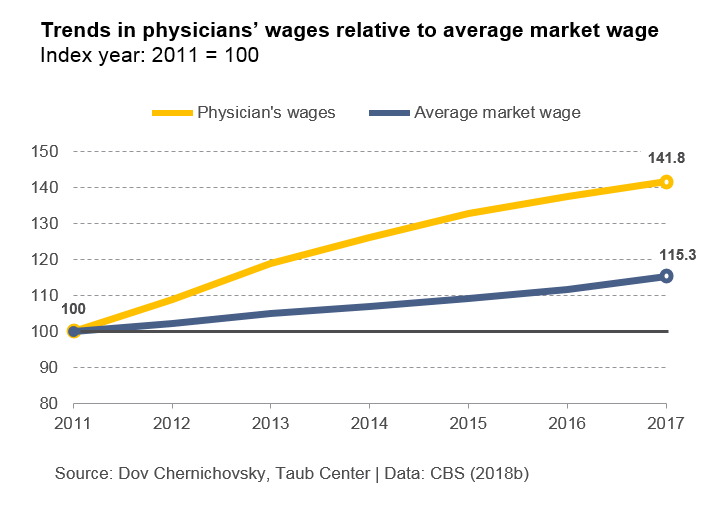 Physician wages in the public sector increased by 42% between 2011 and 2017 while the average wage rose by only 15%. This is because publicly funded institutions need to increase wages in order to compete for their own personnel moonlighting in the private institutions. Additionally, the public health infrastructure has been underutilized because of the “migration” of medical personnel with their patients from starved publicly funded institutions to privately funded institutions for services financed by supplemental insurance. The public-private mix in the Israeli health care system is an ungainly hybrid with no clear distinction between public and private, on the one hand, and no infrastructure to regulate the two, on the other. The state has been trying to confront the issues with ad hoc solutions such as preventing physicians from self-referral to privately funded care for a period of six months and organizing a special program to cut waiting lines in the public system. To confront the challenges created by this ungainly system, one of two models (the principles of which are already in effect in various countries) could be implemented in Israel. In the first model, known as the “separated model,” the public and private systems would exist at separate funding and infrastructure levels, administered in separate institutions. Most importantly, in this model, both citizens and healthcare workers would not move between the public and private spheres. All patients would have to decide whether to receive their care in the public or private system for the duration of a specific treatment. Likewise, healthcare workers receiving income based on public funding would not offer private treatment. The second model – the “integrated model” – would merge the private and public systems. In this model, every resident would receive basic public insurance with extra elective services available for pay out-of-pocket or through private insurance. Another insurance and medical tier would be based entirely on private funding. This model can be compared to an airplane in which one might choose between flying in economy class, business class, or first class – or to fly in a separate, private plane. In this model, the system is regulated so that people cannot pay for shorter waiting times in the publicly-based system and doctors in the integrated system can provide both basic and elective services, but cannot work at the same time in the separate, completely private system. Regardless, because Israel’s healthcare issues are so embedded in the way the system itself functions, they need to be addressed in a comprehensive manner by fundamentally re-examining the system’s structure, incentives, and regulation.